Mushrooms are so versatile to use and so low in calories, about 30 calories per 100 grams and most of all delicious in any shape and form. They’re also high in potassium and in fibers and to me anything that has lots of fibers, cannot be bad, right? This is a quick and simple recipe, that can be served as an appetizer with a simple green mache salad or also perfect for a buffet, as finger food. 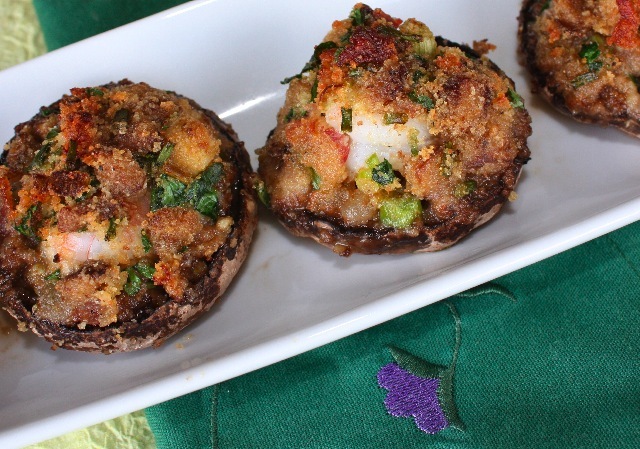 The mixture of the different herbs combined with the shrimps make those mushrooms very tasty and delicate. Those were quite large cremini mushrooms about 6 cm in diameter, perfect for stuffing, I just didn’t want to cut them, they were to pretty to be sliced. If the peel of the mushrooms is thick enough to remove, peel the mushrooms. Also remove the stem and chop in small pieces. Then wash mushrooms and pat them dry. Add salt and pepper. In a small pan, add 1 tsp olive oil, when oil is hot enough, add chopped mushroom stems, stir for 1 min or so, and set aside. In the same pan, add pancetta and cook it for 1 min or so, set aside. In a mixing bowl, add plain breadcrumbs, the mushroom stems and the pancetta. At this point, you can add the herbs, olive oil, salt and pepper – mix well. Take the mushroom caps, add salt and pepper and place one shrimp on top of each cap. Add about 1tbs or more of the crumbs/herb mixture on top of shrimp, the shrimp needs to be well covered with the mixture. Place stuffed shrimps in a tray and cover with aluminum foil. Heat the oven to 370F and put mushrooms in the oven for about 10 minutes, then remove the aluminum foil and let cook for another 10-15 minutes or until the mushrooms are cooked and the top is nicely browned. This entry was posted by silvia on February 27, 2009 at 10:32 pm, and is filed under Appetizers, Fish/Seafood. Follow any responses to this post through RSS 2.0.You can leave a response or trackback from your own site. Mmmm, fabulous! I’ll eat anything with mushrooms in it, I love them!